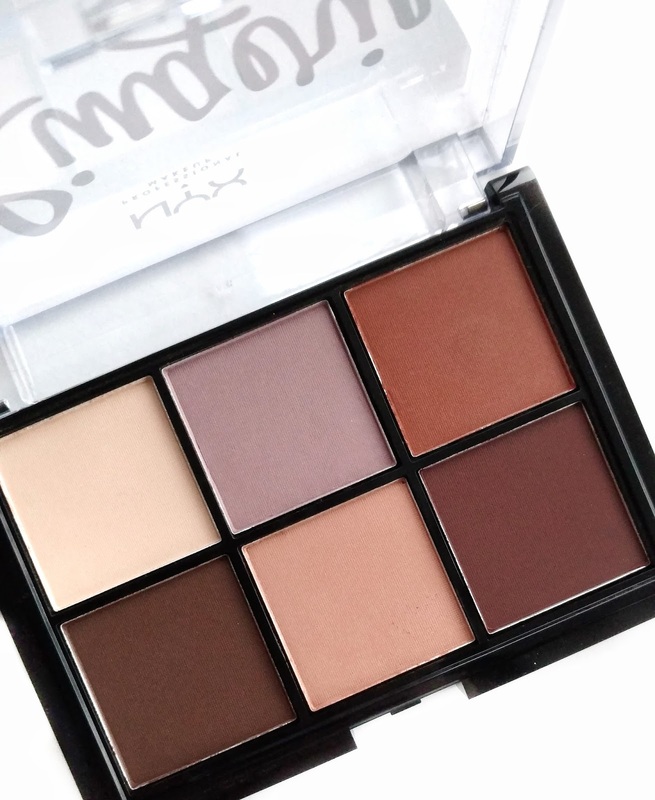 The new NYX Cosmetics Lid Lingerie Shadow Palette was a cute little impulse purchase for me...I was drawn to the wearable, warm neutral shades and the price was right at just under $10. I've also been pretty impressed with NYX eyeshadow palettes lately, especially the Avant Pop collection so I was really hoping that this would be similar. Keep on reading to see my thoughts on this little guy! 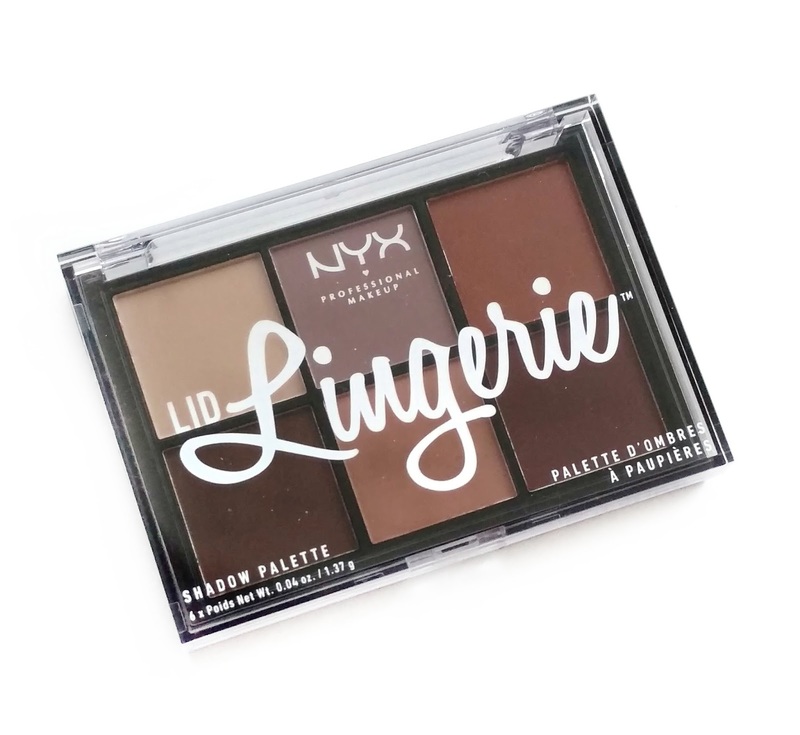 Enhance your eyes with the Lid Lingerie Shadow Palette - a new eyeshadow set inspired by NYX Cosmetics Professional Makeup's much-adored Lid Lingerie Eye Tint. Packed with six blendable shades, this gorgeous palette loads your lids with creamy matte color and incredible payoff. This palette is packaged in a fairly small palette with wide, deep pans. The lid is also very deep, making this feel kind of chunky in your hand. It doesn't include a mirror or a brush, but that's fine with me since I rarely use the ones that are included with palettes anyway. The shade selection is warm-toned neutrals and they all have a matte finish, making it very daytime/work appropriate. 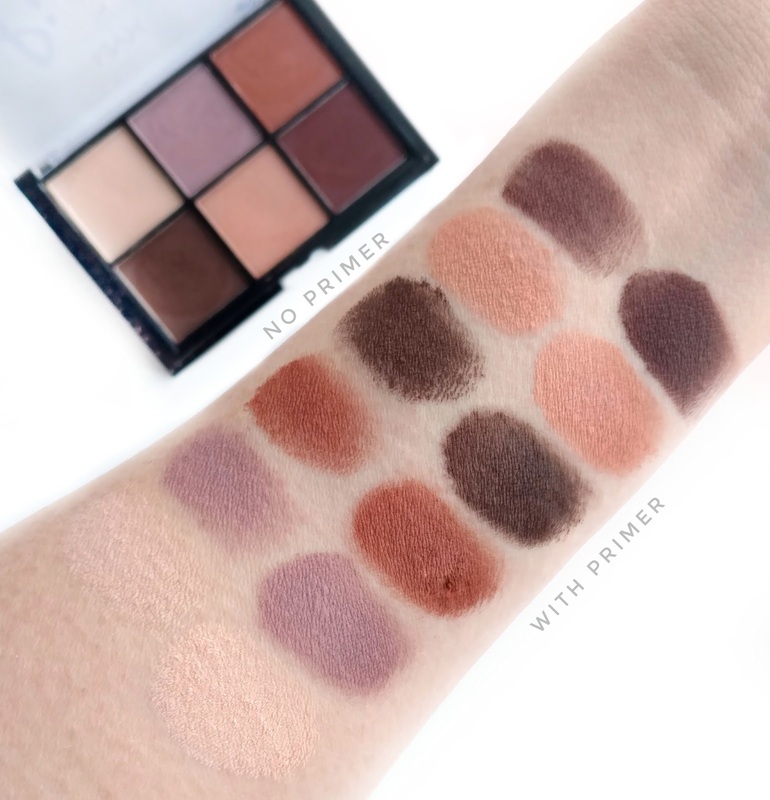 For only having six shades, there's a nice variety in here and you're able to get a complete look (or two or three) using the cream highlight shade, one of the medium shades, and either of the deep browns. The only complaint I have about the shades is that the two dark browns look very similar...especially once they're on your eyes. I would have liked to see something else in place of one of them. Formula-wise, this one is a winner and it very much reminds me of the Avant Pop palettes (except that it doesn't have shimmer shades). 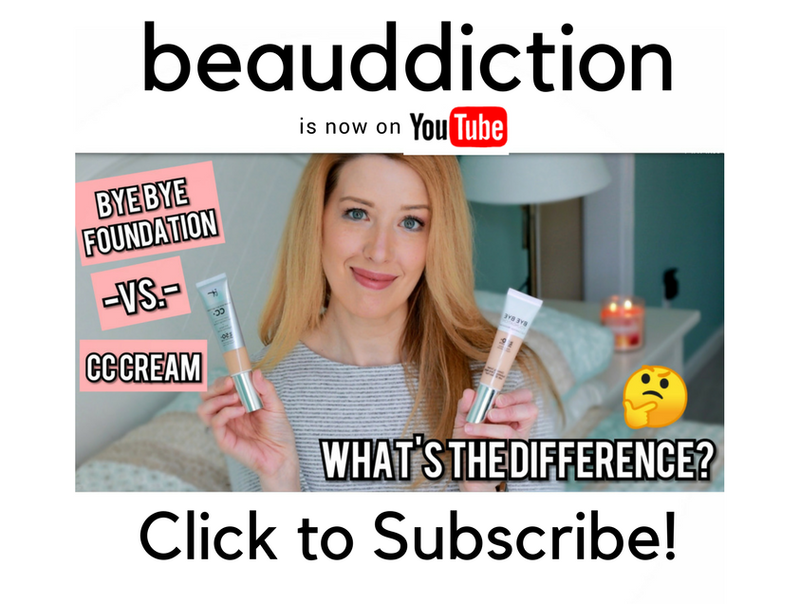 The formula is very smooth and velvety and all the colors are easy to pick up and blend. In the swatches below, I wanted to show what this looks like without primer and then with primer and as you can see, there's not a lot of difference between the two. The lavender shade deepens ever so slightly when swatched over primer and the last brown shade also goes on less patchy over primer. The rest can hold their own, whether they're worn over bare skin or not. 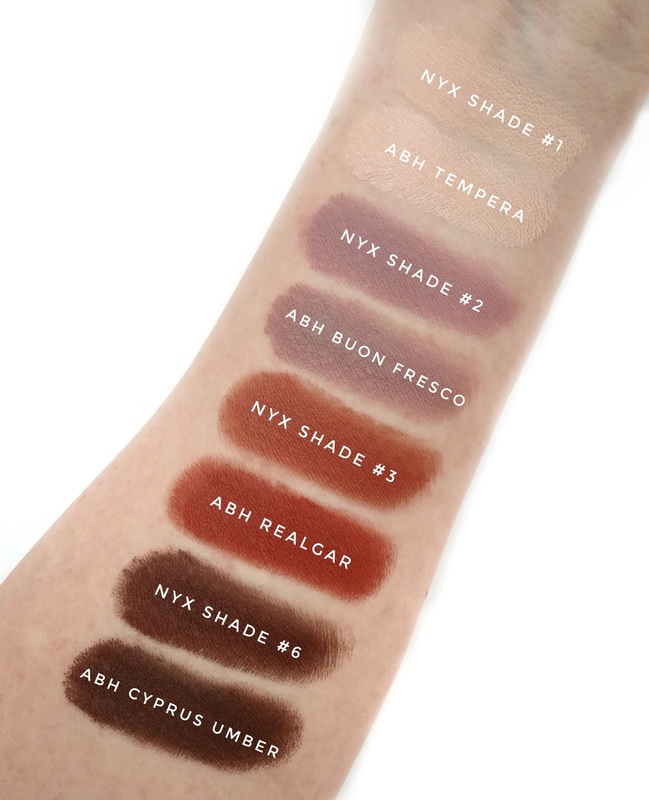 As I was playing with this palette, I also realized that a few of the shades reminded me of the Anastasia Beverly Hills Modern Renaissance Palette so I decided to do some comparison swatches. Four out of the six shades in the NYX palette ended up being very close dupes for shades in the Modern Renaissance palette! In fact, the lavender shade in the NYX palette even went on a little smoother than Buon Fresco from Modern Renaissance. 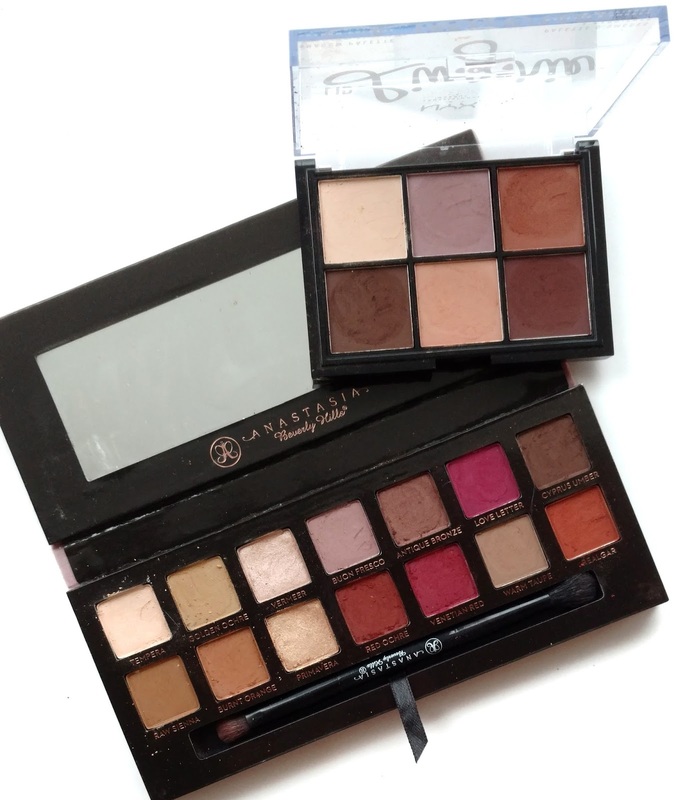 Overall, this is a fantastic little find and even if you own the Modern Renaissance palette, it might be something you'll want to throw into a bag when you're traveling since it's smaller in size. Highly recommended! I don't own the Modern Ren palette but I keep thinking I need to buy it because everyone keeps raving about it. I'm not sure about the orange and red colors so I keep hesitating on pulling the trigger. I like that this one has similar colors and for the price I might just try it and practice with it. If I like it, I'll splurge on the Modern Ren next. Thanks for the swatches! I have this palette and love it so much! It's the perfect little neutral palette. The purple shade is my favorite, sooo pretty. I never even thought to swatch it next to my ABH palette but wow! So many similar shades. I just discovered your blog though IG btw and I love it! Aw thank you so much! So glad you love this palette too! Oooooh thank you, gonna look for this one! Hey Jen! I have this and I agree that it is a lovely little palette. I have to tell you that your honest and often positive reviews of NYX (among other brands that I'd sworn off) have given me a reason to revisit their products, including the Avant Pop palettes, and I'm glad I did. Thanks! -- Christina D.
So pretty! I especially love that pale pink on the bottom middle. Do you know of any dupes for that one color?